I looked forward to reading this book because it was written by Phil Fernandez, who is the President of Marketo. 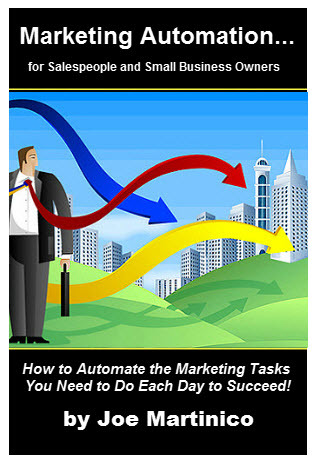 Marketo is, in my opinion one of the hallmarks of marketing automation today. I like companies that eat their own dog food / practice what they preach. Phil was the President of Epiphany software which was acquired by SSA and then Infor, which is a 3 billion dollar company today. So I thought he’d have something valuable to say and I wasn’t disappointed. The book was written in 2012 so it’s very timely. It packs a lot of ideas into 225 pages. So let’s get started. I come from a direct sales background and this book is directed to marketing departments. So for me to say that I didn’t have some resistance to the ideas wouldn’t be true. I guess I’ve played the role of the “Lonely Hunter” that he introduces in Chapter 2 of the book, out in the field looking for a kill each day. I’ve played that role for a good part of my life. I personally think there’s still a good amount of value in a field sales strategy. And to be fair, the author generally respects the role of salespeople in the book. But the book is about a fundamental shift in how people buy products and services today and no one can deny that there’s been a transfer of power from the salesperson to the buyer. And that change requires a change in the way salespeople marketing departments think. They have to begin working together if they want to dominate markets. And it’s not because some marketing guru said they have to change. It’s because the market has changed. Buyers have changed. I have to take a small aside here. I’m sorry. I don’t want to change. I’m a nostalgic collector of old sales and marketing materials. I’ve got stuff that was written in the 1800s about sales and marketing and I love this stuff. Elbert Hubbard wrote a little information booklet called “A Message to Garcia” that has been used to motivate salespeople for a hundred years. I’ve got books written by Elmer Wheeler in 1940s. If you’ve ever heard the expression, “He’s a Wheeler Dealer” you now know where that came from. One of my favorite bookshelf items is a series put out by the Western Life Insurance Company in about 1940 called “Men Who Sell”. I totally want to use this as the theme for a future book or website. And then another favorite written in 1961 by Rosser Reeves is called “Reality in Advertising”. It’s a great read and, being out of print, you can’t buy a physical copy today for less than $100 dollars today. (If you search a bit though, you can download the text of the book for free online). Anyway, I just have a place in my heart for this kind of stuff so you can see why I resist some of these new ideas. Sorry, I had to get that out of my system. So back to the book. In spite of my nostalgic misgivings, I knew this before I read the book and yes it was confirmed. We have to change. Sales and marketing departments need to begin working together. The last book I reviewed, called Marketing Automation by Jeff LeSueur, said a similar thing. 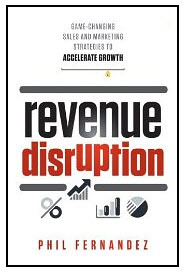 In fact, both books go very far in the direction of tying marketing and sales to revenues; thus the title, Revenue Disruption. In the book, Phil lays out a bit of marketing and sales history himself. I laughed when I saw the section he called, “They Laughed When I Sat Down”. Anyone who’s studied direct marketing will know what I’m talking about. But Phil makes the point that the one to many approach that succeeded so well in the 1950s and 60s has been supplanted today by a model that we could call many to many. People used to learn about products and services from marketers and salespeople. Today, they’re learning about those same products and services online and through their connections. By the time a prospect contacts a company today, they’ve already researched the product they’re interested in online and have a good idea of what they want. They know a lot more than the prospects of the past. So the book goes on to explain how a sea of change has come about in the market, where buyers are now empowered and where they resist the age old sales techniques that I like to reminisce about. And, in fact, the acceleration of this change is literally startling. Changes in the market happen quickly. This is not a trend, it is here now. Salespeople, small business owners, and marketing departments need to understand this to succeed in today’s market In Chapters 8 & 9, Phil shows evidence of the impact importance of this change. He’s got evidence that companies are aggregately leaving trillions of dollars on the table. Then he begins a new chapter showing some of the steps required to act on this change in marketing within companies. The next few chapters show the importance of tying revenue to marketing functions and activities. Phil compares this to the revolution that occurred in business processes years ago when GE and other companies introduced Six Sigma into their businesses. It transformed those business functions, made them more efficient, and increased quality while reducing costs. He shows a model of the revenue cycle where customers go through seven steps in the process including becoming aware, becoming known, becoming a prospect, a lead, an opportunity, and finally a customer. I think his observation about sales funnels really not working like a funnel is insightful. They don’t. He puts it like this, “Water may flow downhill, but leads don’t”. His point is that today, buyers don’t come through a sales funnel in a linear fashion any more. They sort of pop in and out on their own volition and using their own timing. Here again, the transfer of power. It’s not easy to control the “sales funnel” any longer because of the large amount of free information online. I got the impression he may have been taking a little stab at the people from Sirius Decisions, who promote what they call the “Demand Waterfall”. Maybe not. The demand waterfall is a pretty good thing to study when you get around to it. Now in Part Three of the book, Phil goes on to explain the main principle of his book. He calls it Revenue Performance Management (RPM). It’s an important concept and seems to be another iteration of Marketing Automation where marketing functions become more closely aligned with revenue performance goals. You get the impression that Phil would like to see marketing managers reporting to top management in an effort to create a revenue machine. If I were a CEO, that wouldn’t sound bad to me. He also makes a point of the difficulty that management often has (and I’ve seen this as I’ve discussed the concepts of marketing automation myself) where they’re concerned that the automation of marketing could become offensive, like robots calling on customers. Well that is a valid concern but marketing automation done right and with the proper tools can overcome that. Personalized, appropriate, relevant, and timely customer communications can be achieved with the proper implementation of modern marketing automation tools. It starts with helping your buyers find you! Wow, what a novel concept! Basically, this involves developing a system for the creative development of useful content that clients can access online (and offline) at the various stages of the revenue cycle and keeping it appropriate for that particular stage. The book defines those various stages and the appropriate types of content for each of them. Then he discusses lead management. This is the way that today’s systems segment prospects and customers in a way that makes sense and allows marketers to communicate appropriately. It’s often called lead scoring and lead nurturing and it can be done more effectively today than ever if there is buy-in and cooperation across the entire company. It’s a way of building relationships before asking for orders. In Chapter 19, Phil discusses how analytics can be used today to continually improve the RPM process and the customer experience. He uses the age old adage about how “Half of my marketing dollars are wasted, If only I knew which half”. and points out correctly that today’s CEO’s can know which half. They can. In fact, he thinks that the knowledge gained from well used analytics can even drive the hiring plans of marketing and sales departments once it is in place. 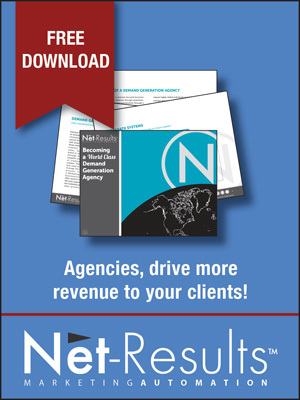 It allows marketers to understand, predict, and scale growth. That’d be a dream come true for many companies today. Finally at the end of the book, he gives shares some ideas about how to put this all together, including the software, the possible hiring of a Chief Revenue Officer, and how to deal with the cultural problems that naturally come with any kind of corporate revolution. It’s good advice. For example, in large companies he suggests starting with one division as a test. Starting small makes a lot of sense to me in that kind of environment. So that’s Revenue Disruption in a nutshell. I liked it. It’s a great book in a great time. This is a book that everyone should be reading. It’s fun and written well and it’s one of those “bellwether books” explaining in some detail how the world of business is changing and how to at least begin the process of taking advantage of the changes in your business. My thanks to Phil for a great book and to Marketo, which is a company that I really admire and one that shares information freely. It’s been a great help to me. There is one more thing… To cap out this review, I’d like to say something that’s important to me and I think that add some value to this discussion and the ideas brought up in Phil’s book. He uses some imagery that is wrong about what I consider to be the truly successful salesperson. One of those that he brings up in the book is Alec Baldwin’s portrayal of the jerk Sales Manager in Glengarry Glenn Ross. I don’t like that movie because of the stereotype it made famous. I kind of wish that it wasn’t used so often as a sales analogy. Mostly because I’ve never considered those types of salespeople professionals anyway. And by the way, I sold cookware door to door pretty successfully for ten years, so I’ve been in an environment where high pressure sales techniques were often preached. I never used them. I never needed them. I believed in my product. Still do. I met my wife that way. She was a customer. I even sold cookware to her three sisters over those years. I never pressured them. . And we still have and use the product I sold her over 30 years ago. The key is that we need to make sure we’re selling a product that we believe in and that offers real value to end users. If you have that kind of product and you know how to explain it properly, you should never have to resort to old fashioned high pressure stereotypical methods. The cool thing is that today’s marketing automation ideas and technologies can make a good salesperson great and a good marketing department exceptional.